Lozier Single Sided Wall Gondola Shelving Provides Customizable Storage Fixtures For Convenience Stores, Retailers, Markets, Grocery, Mini-Marts and Other Merchandisers. Wall shelving units allow placement up against the wall to save valuable floor space. Sturdy construction includes 12 gauge uprights that support height adjustable upper shelves with 500 lb. capacity (sold separately). Backplates are made of 1/4" masonite pegboard for long lasting durability. Easy assembly requires no nuts or bolts. To build a row, purchase one Starter Unit and the required number of Add-On Units to complete the length. Optional End Caps complete row ends (not required). Adjustable Upper Shelves (sold individually) hold 500 lbs. and hook into uprights either level to floor or at 17° angles and adjust at 1" increments. Chrome Wire Baskets hook into uprights. Shelf Dividers and Ends keep merchandise in place on shelves. Color finish is Almond with Black Toe Kick Plates. Dimensions vary per model. Custom sizes, styles & colors available upon request. Lozier Double Sided Aisle Gondola Shelving Provides Customizable Storage Fixtures For Convenience Stores, Retailers, Markets, Grocery, Mini-Marts and Other Merchandisers. These premium quality gondola shelving fixtures are flexible to adapt to specific needs or requirements. Expanded selection includes low units for convenience stores and smaller retailers, and taller units for large supermarkets and general merchandisers. Sturdy construction includes 12 gauge uprights that support height adjustable upper shelves with 500 lb. capacity (sold separately). Backplates are strong 1/4" masonite pegboard. Almond color with black toe kick plates. Easy assembly requires no nuts or bolts. To build a row, purchase one Starter Unit and the required number of Add-On Units to complete the length. Optional End Caps complete row ends (not required). Adjustable Upper Shelves, sold individually, hold 500 lbs. and hook into uprights either level to floor or at 17° angles and adjust at 1" increments. Chrome Wire Baskets hook into uprights. Shelf Dividers and Ends keep merchandise in place on shelves. Lozier End Cap Gondola Shelving Provides Customizable Storage Fixtures For Convenience Stores, Retailers, Markets, Grocery, Mini-Marts and Other Merchandisers. 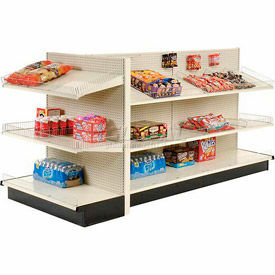 Lozier Gondola End Cap Shelving includes low units that are designed for convenience stores and smaller retailers and taller units for large supermarkets and general merchandisers. Units allow completion of double sided aisle shelving units to save valuable floor space. Sturdy construction includes 12 gauge uprights that support height adjustable upper shelves with 500 lb. capacity (sold separately). Backplates are strong 1/4" masonite pegboard. Includes black toe kick plates. 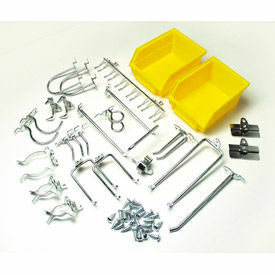 Easy assembly requires no nuts or bolts. 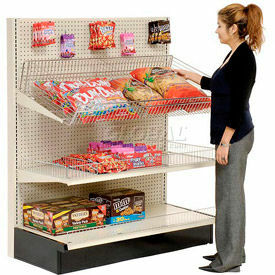 Economy Retail Gondola Shelving Maximize Space And Organize Products To Maintain Traffic Flow. 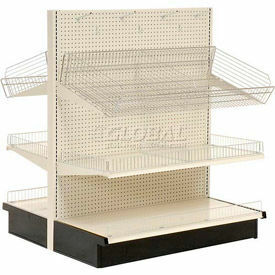 Economy Retail Gondola Shelving are made of steel to provide long lasting durability. Single-sided gondolas snap together for easy assembly. 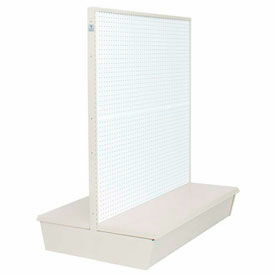 White pegboard back panel has one-inch peg hole pattern to hang shelving, baskets and peg hooks (sold separately) and provide organized display. Weight capacities are 375 lbs and 750 lbs. Dhelving is 54" H. Other dimensions vary per model. Color finishes are Almond and Black. 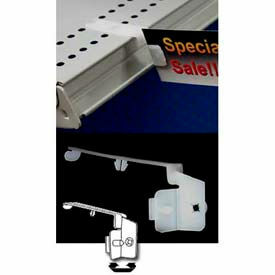 Gondola Shelving Accessories Provide Sturdy Signage Displays For Retail And Commercial Store Fixtures. 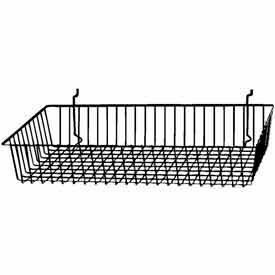 Gondola Shelving Accessories are made of polypropylene, PVC, vinyl, styrene, and steel for long lasting durability. Sign holders are designed to catch the eye and deliver a clear sales message or display a price for added visibility on store shelves. Available types include Adapter Bar, C-Channels, Hangers, Hooks, Mounting Kits, Shelf Dividers, Sign Holders, Vinyl Pouch w/Hanging Hole, and Wobbler Sign Holders. Colors are Clear, Gray, Silver, and White. Dimensions and quantities vary per model.